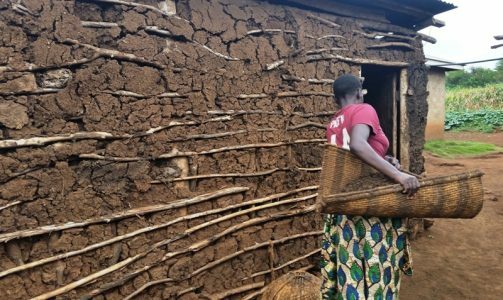 In June earlier this year, Lucy, the Director of BGE went on a fact-finding mission back to Tanzania to research more about the design process and the incubation of ‘grassroots’ innovative technologies at the Twende Social Innovation Centre. 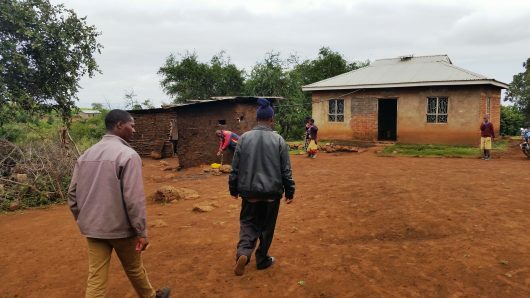 Bright Green Enterprise has been working on various projects with Twende since 2013, helping to promote its work here in the UK as well as collaborating on skills-sharing challenges between schools in the UK and Tanzania. In that time Twende has been driven from strength to strength as a workshop and maker-space for local youth and adult innovators. The grassroots appropriate technologies that Twende helps to design and incubate are established for the local market. Most have an agricultural focus due to the dominant industry that makes up around 80% of the workforce across the country and within this are many smallholder farming communities. A typical example of such would be found in the Mbulu Highlands nestled alongside the famous Ngorongoro crater edge (a landmark of the Great Rift Valley), where many smallholder farmers from the Iraqw community reside. Their long-standing subsistence way of life has seen the Iraqw people live off the land for hundreds of years, farming with livestock and local tools that prepare and manage their crops; such as the traditional basket (luki) method shown in the main picture above where crops are managed by the women by hand. The challenge, of course, is to get crops producing the most yield per acre in order to provide enough food for the family to live from as well as to try and produce enough surplus to sell at local markets for a cash income. 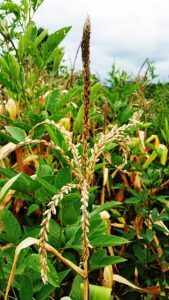 In recent years, however, land fragmentation and a degradation in soil fertility have led many farmers to seek new methods of preparing and harvesting their crops. This is sought for a number of benefits, including reducing the stresses of hard labour for women (whose role it is to prepare and manage the land), increasing crop yields to improve economic prosperity as well as improving the quality of produce. 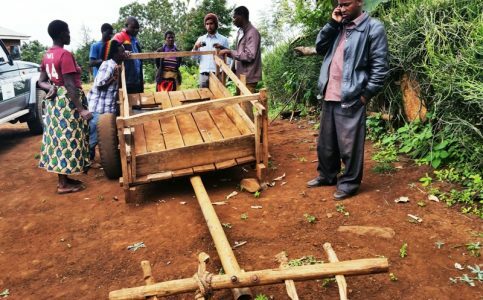 To meet these new social, economic and environmental demands, Twende is developing a number of technologies that can be deemed appropriate to meet local smallholder farmers’ needs; and one of these is Frank Mollel’s ‘manure spreader’. The first machine off the production line and fitted to an existing farmer’s cart! OK, so manure may not be the most glamorous of topics to research innovation around but it is a vital component of the food chain due to its intrinsic value as an organic and sustainable fertiliser of crops. It’s also a growing part of agricultural practice for smallholder farmers across Tanzania. The new machine was produced using Twende’s own design process method that takes a human-centred approach for researching and developing new technologies. By working with potential users in their own setting, not only can the human / user experience be uncovered but also the active environment (activity-centred design) in which the technology would be used (the activities surrounding the technology to which it will be a part). This way, the incoming innovation can provide benefit and change to improve people’s way of life (a so-called ‘disruption’ for social good) but can also work with existing community systems inside the ecological setting to lessen the disruption to surrounding networks. 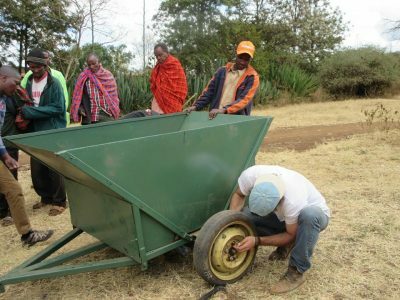 The resulting efforts of this are in the manure spreader machine’s use as a community technology – co-built, shared and cost managed within the local community network so as to bring maximum benefit between households at an affordable price. To find out more about Twende and Frank Mollel’s manure spreader, visit www.twende-tanzania.org. 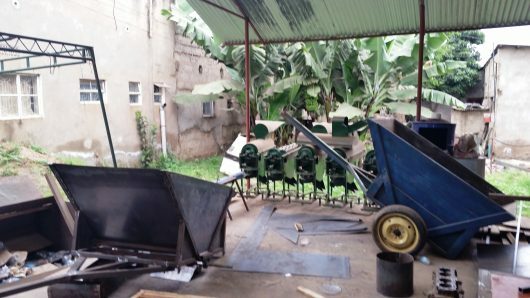 Workshop at Twende where the manure spreader is manufactured. Claudio’s family farm – a typical household dwelling in the area. 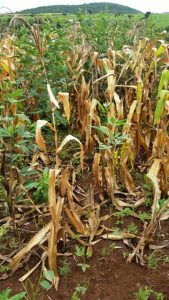 Above is maize without using manure fertiliser (left) and with using manure fertiliser (right).